Our travels take us on searches for original Early American & country-style furniture, primitives, and other unique items such as bucket benches, Buttock baskets, dough bowls, and copper kettles. 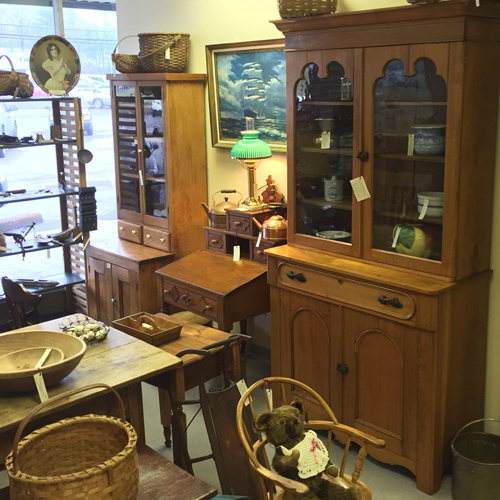 Flinta Antiques is proud to be part of the best antique mall in the St. Louis area. After over 40 years in business, it is still a thrill to find a very early piece of furniture–that truly unique item or that buried treasure way in the back of a dusty barn. We love doing this because it’s such fun showing and bringing these items to you, our customers. Thank you for your support. We’re looking forward to another 40 years of business.